Donald Trump’s pick to lead the Department of Health and Human Services (HHS), Georgia Rep. Tom Price, fielded tough questions Wednesday from the Senate’s Health, Education, Labor, and Pensions Committee. Price, an orthopedic surgeon-turned-lawmaker who once chaired House Budget Committee, faced a grilling over his positions on the Affordable Care Act, the Republican repeal efforts, funding for social security programs, and the latest contentious revelations about potential conflicts of interest in stock buys Price made while in Congress. Under questioning from HELP committee chair Sen. Lamar Alexander of Tennessee, Price suggests that the Affordable Care Act will be replaced piece-by-piece. Of the ACA, Price said, “no one is interested in pulling the rug out from anybody” about potential losses of health insurance under a repeal of Obamacare. “We believe that it’s absolutely imperative that individuals that have health coverage be able to keep health coverage and move, hopefully, to greater choices and opportunities for them to gain the kind of coverage that they want for themselves and for their families,” he said. Price did not, however, commit to maintaining the current funding levels for Medicare and Medicaid programs, despite promises by Donald Trump during the presidential campaign not to touch those social safety nets. Just as Donald Trump faces his own potential conflicts of interest, Price also underwent intense scrutiny over his own stock trades and investments involving health care companies over the last four years. Price denied that he had engaged in any insider trading or other conflicts of interest, saying that his investment portfolio was managed by a broker and he had no knowledge about the stocks that were bought in his name. As the New York Times reported earlier this week, Price had bought and sold stocks worth more than $300,000 over the last four years -- including shares of at least two health companies that could have benefited from legislation Price championed while in Congress. “The fact of the matter is that I have had no conversations with my broker about any political activity at all other than her congratulating me on my election,” Price told the committee. He confronted the concerns just as some senators are calling for an investigation into those investments as a possible violation of the Stop Trading on Congressional Knowledge Act, which makes it illegal for legislators and their staff to trade stocks on information that isn’t made public. The Georgia congressman will be subject to confirmation by the full Senate, and will also face another confirmation hearing before the Senate Finance Committee on Tuesday. The finance panel will vote on whether to recommend confirmation. 2:00 p.m. ET Price’s Senate hearing comes to an end. 1:40 p.m. ET Sen. Patty Murray called for an investigation into Price’s stock buys. Later, the Washington senator hammered Price on past statements expressing skepticism at the need for birth control coverage in the Affordable Care Act. Asked whether he would commit to funding and keeping the HHS department’s Office of Minority Health Resource Center, Price refused to say. 1:00 p.m. ET Sen. Elizabeth Warren, D-Massachusetts, attempts to pin down Price on a promise not to roll back the budget for Medicare and Medicaid -- a promise Mr. Trump had repeatedly made during his presidential campaign. “Can you assure...that you will not cut from either Medicare or Medicaid should you be confirmed to this position?” Warren asked. Price dodged the question, saying he believed the fulfillment of those promises should be measured in whether patient care has suffered -- not measured in the dollars funding the programs. “I think the metric should be care,” Price said. When asked once more about his stock purchases and their possible conflicts of interest with legislation that he’s sponsored in the past, Price replied that “I wasn’t making those decisions” on what stocks to buy. He said they were “bought by a broker,” and though they’re “made on my behalf,” he did not direct the trades. Later, Price clarified that he did direct his broker to buy stock in Innate Immunotherapeutics after discussing the company with Rep. Collins of New York. 12:45 p.m. 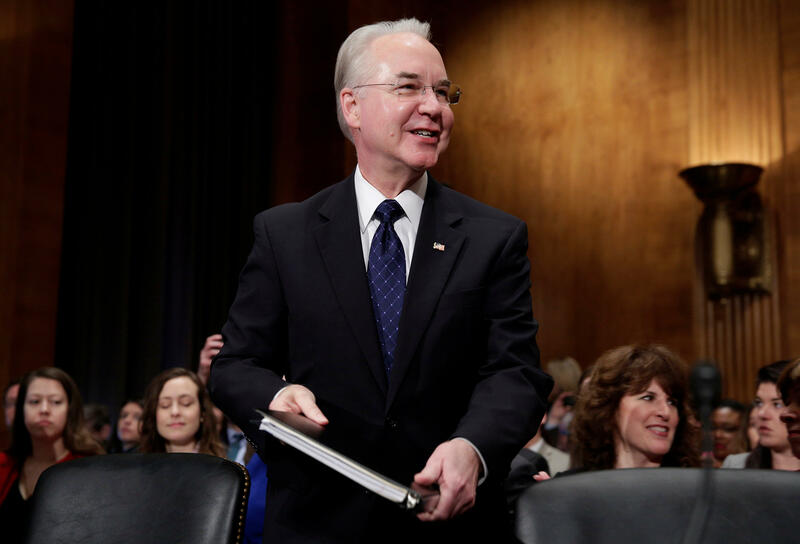 ET At least six senators have pointed to Tom Price’s stocks in health care companies as problematic in his position as a congressman and also as a possible HHS secretary, with Sen. Chris Murphy, D-Connecticut, being the latest to bring it to the fore. 12:25 p.m. ET Sen. Tammy Baldwin, D-Wisconsin, questions on Price on whether any of his campaign contributions have been from drug and health care companies. Price says he doesn’t know for certain but he suspects that is the case, pointing to similar contributions from drug and health companies to the campaigns of other members of Congress. “Would you support drug price transparency?” Baldwin asked, expanding on a proposal to require drug companies to make public information that goes into pricing their products. “I think there’s a lot of merit in every area,” Price said, noting that he looks forward to working to ensure more transparent dealings when it comes to fluctuating drug prices. Price was also asked whether he would support Medicare negotiating drug prices -- a stance Trump has articulated. 11:50 a.m. ET Sen. Michael Bennet, D-Colorado, attempts to pin down Price on a promise that any replacement plan by GOP legislators will not add to the nation’s deficit and debt. 11:36 a.m. ET Sen. Al Franken of Minnesota pressed Price further on his questionable stock buys, including some tobacco company stocks he held years ago. “I have no idea what stocks I held in the ‘90s, in the 2000s, or even now,” Price said, noting that mutual funds and pension funds decided where his money went. Sanders to HHS nominee: Is Trump lying about medicaid? Franken expressed skepticism at this, and went on to slam Price for the “more than 300,000 dollars in health-care related stocks” he held while at the same time sponsoring legislation that could have impacted those stocks. 11:05 a.m. ET Sen. Bernie Sanders of Vermont questions Price on his differences with Donald Trump on Medicare, Medicaid and Social Security. Sanders pointed out that Mr. Trump claimed repeatedly he wouldn’t cut Medicare during his presidential campaign, but the HHS nominee has been in favor of making deep cuts to the policy. 10:50 a.m. ET Sen. Patty Murray of Washington pushes Price hard about his questionable stock investments. “I believe it’s inappropriate,” Murray said. According to Murray, Price told her in a meeting that Republican Rep. Chris Collins of New York gave him a stock tip on an Australian biotech firm. But Price says Collins had simply told him about the firm. 10:35 a.m. ET Tom Price gives his opening statement at his confirmation hearing. He expressed robust support for the “promise” of Medicare to seniors. Later, under questioning from Tennessee Sen. Lamar Alexander, Price suggests that the Affordable Care Act will be replaced piecemeal. Of the ACA, Price said, “no one is interested in pulling the rug out from anybody” about potential losses of health insurance under Obamacare repeal. He laid out plans for Congress to focus heavily at the start on reshaping the marketplace for individual policies and on changing Medicaid, which covers low-income qualifiers. Price said the initial legislation should not change Medicare, which covers older people. 10:00 a.m. ET Top Republican Sen. Lamar Alexander of Tennesse, who chairs the Senate’s HELP committee, pushed for Republicans not to finalize a repeal of Obamacare until it has a replacement ready. Sen. Patty Murray, the ranking Democrat on the HELP committee, said in a statement at the beginning of the hearing that Price will face tough questions on Obamacare and his own investments and stock trades involving health care companies. Murray also voiced her concerns on how Price’s policy stances could impact women’s access to health care, including access to Planned Parenthood. Of Price’s House vote last week easing the passage of legislation in the future that could completely nix Obamacare, Murray said people in her home state “have tears in their eyes” at the possibility of losing their heath care coverage.